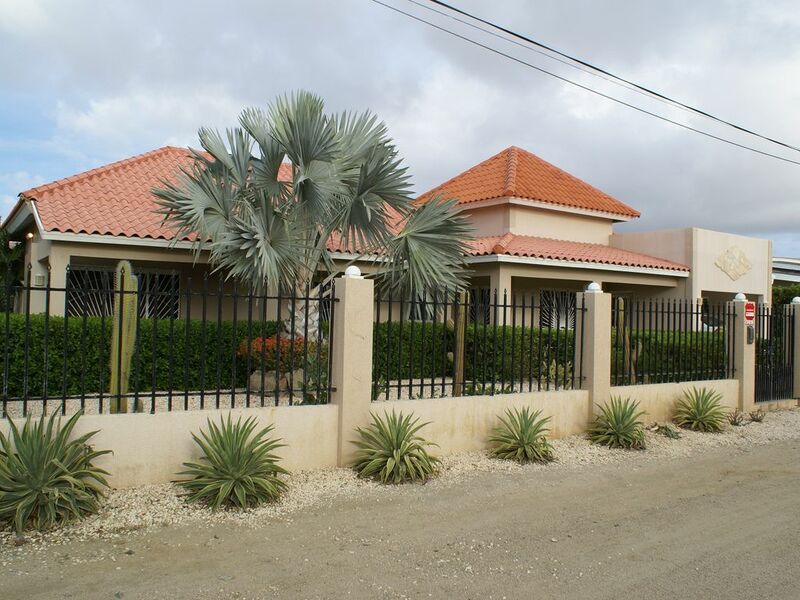 You will find our villa in the Palm Beach area of the island, a beautiful and quiet area close to the 'high-rise' hotels (such as Marriott and Hyatt) and only 10 minutes by car from Oranjestad with its nice bars, restaurants, shops and beautiful boulevard. Our villa is located on more than 6,400 square feet of land and less than 10 walking minutes to the beautiful beaches depending on which beach and what you carry. This 2740 square foot villa was built in 2003. It can be rented as a 3BR or 4BR (Additional building with 4th bedroom, with Full-sized bed and bathroom). It is fully equipped for 2-8 persons, The new garden offers sufficient privacy. The newly constructed pool was completed in May 2008. About the Island: With an average temperature of 82F all year round, only the wild heat of the casinos and disco nightlife can make things a little on the steamy side. Aruba is enchanting due to its ability to allow your to relax and escape from the pressures of your everyday life. It permits you to experience the extraordinary and the unforgettable. The pearly sanded beaches and azure blue waters beckon you to join in with a number of exciting activities, such as swimming, jet skiing, sailing, surfing, windsurfing, boogie boarding, and much more! To add the extra outside 4th bedroom the rent will be an extra $250.00 + taxes a week. Please note we are selling our Christmas week and New Year week as two separate weeks or both together. Christmas week from the 20/21st – 28th/29th December and New Years week from the 28th/29th Dec – 3/4th January. We will not be accepting check-ins on the 25th , 26th December or the 1st of January. Vacuum cleaner Crib/playpen, high chair, and 2 booster chairs also available if needed Safe bolted in the closet of the twin bedroom. Large enough to hold laptops, cameras, jewelry, passports and other valuables. The best place I've stayed at. Management was incredible. Service the best....everyone we dealt with was accommodating and more than helpful with our entire group. I would definitely rent this place again. Pleased with house and stay. House was as described. Clean and relaxing. Excelente ubicación y muy cómoda! La casa es alucinante. Esta ubicada en un lugar muy cómodo para llegar a la playa y cerca de shoppings y restaurantes. Es amplia, cómoda y tiene todo lo necesario para pasar unas excelentes vacaciones. Lo único que le faltaría es que renueven los colchones. La atención de la oficina que la alquila es muy buena. Nos dieron toda la información previa necesaria para llegar. Elisa y Ana hablan español y nos atendieron con especial amabilidad. Muy recomendable. Gracias por todo!!!! We recently stayed in this rental property (April 2017). Overall we were happy with the location of the property. About a 10 minute walk to the beach, very close to the high rise hotels, restaurants, shopping and grocery shopping. We rented a car but not really necessary. The property is located in a neighborhood, we felt safe since the property was equipped with an alarm system and security blinds. The property had a pool which we enjoyed and the outside patio area was great, equipped with a gas grill. I do want to point out that the house was dated and definitely needed updating. We were disappointed that the living room furniture and the beds were uncomfortable, mattresses definitely need to be replaced. Beach towels and bath towels were abundant but old and well used. We were under the impression that we would have beach chairs, however they were not available at the house and had to rent them from the property management company $15/chair/wk: cash only. We had a few issues with the toilets, when we called the management company they came right over to fix them. As I said overall we were happy and may even rent this property again but would be happier if they replaced the furniture and mattress. The house is in a nice nighbour close to every things. quit place. I recommend you to stay there. is a nice place to stay.